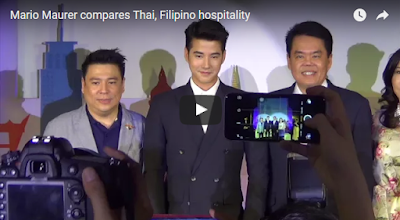 Mario Maurer, an established actor in his home country Thailand, appeared in a press event in Manila on Saturday where he encouraged Filipinos particularly his fans to visit the Kingdom of Thailand. In a report from Inquirer.net, there were 360,000 Filipinos who visited Thailand in 2015. The Thai superstar and new tourism ambassador who is currently on a promotional tour in Asia to encourage more tourists to visit the “Land of the Free,” recommended the cities of Bangkok, Chiang Mai and Pattaya. It can be recalled that Maurer caught the hearts of Filipinos when he starred in the 2012 movie “Suddenly It’s Magic” opposite Filipino actress Erich Gonzales. Previous Previous post: Vice President Leni to receive Thai honor TODAY!